Quinnipiac had the past weekend off after a trip out to the desert and now its back to Hamden for the first time in almost two months starting with a Tuesday game against Princeton followed by weekend slate against Clarkson and St. Lawrence. Currently sitting in 9th place in the ECAC standings, Quinnipiac has nine games left in order to improve its playoff position or it could find itself without a home playoff series for the first time since the 2006 season. A handful of future Bobcats had strong weekends so lets take a look at who did well over the past week. Michael Lombardi had a big week with six points (3 goals, 3 assists) in three games played. He had a goal last Tuesday and over the weekend had a three assist game and a two goal game. In 47 games played he has 34 points (15 goals, 19 assists). It was another strong weekend for Ethan De Jong with 5 points in 3 games played. He had a goal and four assists and leads the team with 51 points (16 goals, 35 assists) in 42 games played. 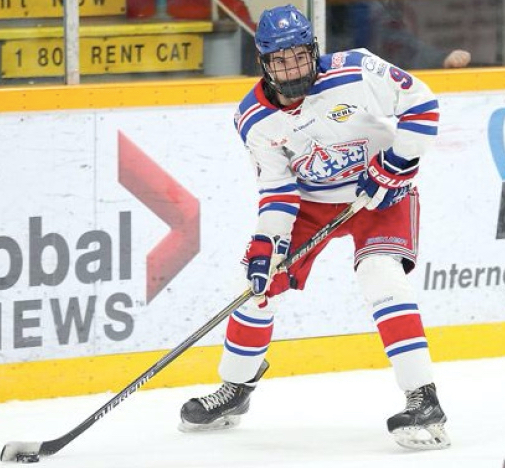 He is #154 on the NHL central scouting list for North American skaters and the stronger he plays he could shoot his name up on the central scouting rankings prior to the draft. Desi Burgart had one assist in two games played this week for the Surrey Eagles. In 43 games played this season, Burgart has 39 points (17 goals, 22 assists). 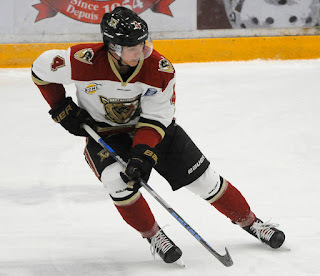 T.J. Friedmann had a three point weekend for the Victoria Grizzlies with two goals and an assist in two games played. In 48 games played this season he has 41 points (17 goals, 24 assists). Dom Fensore picked up three assists for the U-17 team in two wins in USHL action over the weekend. In 19 USHL games played, Fensore has 10 assists. In all game action this season he has a total of 20 assists in 34 games played. William Fallstrom picked up one assist in two games played for the Fargo Force over the weekend. In 34 games, the Sweden native has 21 points (6 goals, 15 assists). Justin Robbins made 31 saves in a 6-2 win for the Chicago Steel over the Madison Capitols. On the season he is 3-3 with a 4.32 goals against average and an .867 save percentage in 9 games played. Zach Metsa had one assist in three games played for the Youngstown Phantoms this weekend. He broke an 11 game pointless streak dating back to December 28th. On the season, Metsa has 13 points (1 goal, 12 assists) in 35 games played from the blue line. Matt Cassidy had two assists in two games played this weekend for the Brooks Bandits. On the season, Cassidy has 34 points (14 goals, 20 assists) in 39 games played. Matthew Fawcett leads New England Prep hockey in scoring with 45 points (15 goals, 30 assists) in 17 games played. He is averaging 2.65 points per game this season. John Campomenosi had one assist for Don Bosco Prep in 2 games played this week. On the season he has 18 points (5 goals, 13 assists). Gus Van Nes had another 3 point weekend. In 2 games played the Dutch born forward had a goal and 2 assists. Van Nes 51 points (15 goals, 37 assists) in 38 games played this season. Daniel Winslow had twos assist in two games played for the New Jersey Hitmen as his team won a pair of games this past weekend. In 33 games played he has 28 points (9 goals, 19 assists). Victor Czerneckianair has a strong season for the U-15 Selects team at South Kent. In 41 games played this season he had 58 points (24 goals, 34 assists). The Southington, CT native is 3rd on the team in scoring and a possible candidate for the NDTP program.